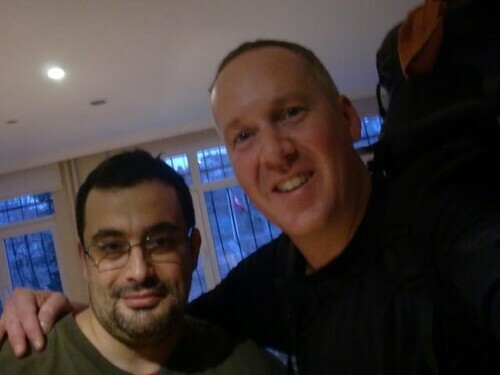 For the first couple days of my stay in Istanbul, I crashed at Hakan’s place. Hakan is one of the most patiently consistent followers of my walk across Turkey. He found out about the trip via the website Kickstarter.com back in September, shortly after I first started walking. One of the things I remember most about him is that back in September, when I posted on this blog that I was camping at a gasoline station outside of Denizli, within moments Hakan had found a photo of the gasoline station on Google Earth and posted it on Facebook. He knew where I was even better than I did! Hakan is practically my human-powered GPS system, and I know that if I post anything on the blog even remotely question-like, within minutes Hakan will find an answer, if he doesn’t know the answer already. When I was in Istanbul in November, we met face to face and have been friends ever since. Thanks Hakan, it was great to see you again!